Hydraulic Oils that meet the performance criteria of military specification MIL-H-5606 are highly refined, mineral-based hydraulic fluids that are used in many aviation and land-based hydraulic systems. These hydraulic oils are very "clean," meaning they contain minimal if any paraffin (wax) that would affect their flow rate and performance at low temperatures. 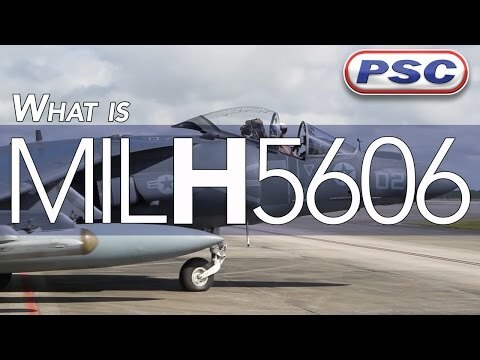 The current Military Specification for use in an Aircraft Hydraulic Systems is MIL-PRF-5606H. These hydraulic fluids are considered "super clean" due to their cleanliness and lack of moisture content. Most hydraulic applications calling for an oil meeting MIL-H-5606 are land based hydraulic applications that don't need to meet the "super clean" requirement. The products on this page represent all the different service levels of MIL 5606 type hydraulic oil. Refer to the individual product's Product Data Sheet to verify if it meets the service level for your application.